Harmony remote and truly felt that it was a total waste of time and money. My habit was to buy it and then return it to the store thinking it’s useless and not worth a penny. Since so many years, I’ve been completely distrustful about purchasing any product of Logitech Harmony ever again. But one day I saw a video on YouTube showing that tv can be turned on and off with Alexa. I was shocked, and after exploring a bit, I got to know that the ideal way is to use Logitech Harmony Hub. I was still suspicious but, in the end, I was happy that I bought this, totally worth it. Harmony hub is a connected device that can work as the brain for your smart home devices and entertainment system. In case of the device isn’t Wi-Fi or Bluetooth compatible, there is also an option to connect it with stereo, Tv, smartphone, or tablet. It works like a high-tech global remote which uses your tablet or smartphone to run your smart devices. If we talk about looks, it is like a hockey puck with a surface which looks like a polished stone. Its surface is black with a USB port and a reset button on the back which you can use to pair with multiple devices. The Micro USB port has multiple features; it delivers power supply as well as it helps to connect with computer to function it. When you look at the front of your device, you’ll see a LED light which will tell you if the hub is connected or not, also it tells whether the hub is still active. Harmony Hub device is 4 inches high, 4.8 inches wide, and 1 inch broad, which makes it simple for you to put it wherever you want. Device weight is 3.9 oz. Harmony hub can support more than 270,000 gadgets, and it usually connects to them by Bluetooth, wireless, and infrared rays. It allows you to manage all smart connected devices around your efficiently. These devices include multiple televisions, gaming consoles, AV receivers, Light bulbs, streaming devices, and famous Amazon’s Alexa, the list is long, and the list is surprising. A small black device which you can easily grab in your palm can control devices of 6000 different brands. If you’re using a different remote for AC, different remote for tv, different remote for refrigerator, then you should throw all remotes and use this all in one remote. This Harmony Hub remote can also control door locks, plugs, lock windows using a smartphone. This device is flexible and helpful which makes it a wonderful technology. Some years before people made a mindset that this device is useless and a waste of money, but now some people can’t live without this Harmony Hub. The individuals who can utilize this nicely, for this is a cool gadget. Harmony Hub device box will contain a hub, USB cable, a power adaptor, and IR mini blaster. There is no given power port, but it has a micro-USB socket and a button on the back for pairing the device. You also have the option to reset it from the button on the back. The wall wart styled external power can be connected via the same micro-USB socket which is used to connect the device with the computer. People say that the Led given in front distract us while watching tv, but we didn’t face any problems. Instead, it shows us the state of the device (about its connectivity and activity) You’ve to connect IR mini blaster to the back of the hub. Where two external ports are given. It is used to expand the coverage space for IR control devices, and it helps the devices read the signal properly which are behind the doors or in the cabinet. Inside the device, there is 802.11b/g/n, Bluetooth which can control PS3 and Wii). Logitech has done a brilliant job by adding Bluetooth as it’s great for the gamers who are dependent on their Bluetooth gaming consoles. It would have been better if Harmony Hub was able to support RS-232 for double control, or sensors like power or video out. Presently the facts demonstrate that IR is yet the most genuine universal home theatre control protocol, however, if it were able to control A TiVo or DIRECTV Genie via IP, then this device would be a best one for its users. Once you have powered on and connected your harmony hub, you can download the app and start the Wi-Fi setup. Harmony hub works on both IOS and Android devices. For those people who’re using older IOS version, they should set up the device using a PC. Open the harmony hub desktop software and make your account. Then, follow the WIFI setup and hub. After you’re done with downloading the application, ensure that Bluetooth is connected on your phone and you’re connected with Wi-Fi. The Harmony Hub will automatically pair and connect in a few seconds. You can now log in to your Wi-Fi and connect to the hub. Next stage is for the devices which were not found during this setup process. Harmony hub spontaneously starts to look for the devices which are connected to Wi-Fi. You should press the Add Device button which is located on the bottom of your screen, for the devices which are not added automatically. At this very moment, this Hub found one of the smart locks. Using this Harmony app, you can set up the hub to control this smart lock. Other brilliant home gadgets Logitech’s hub associates with include some of the best savvy home devices, including Lutron Serena windows shades, Philips smart lights, Honeywell thermostats, an Instron. If you want to connect other devices, you can just enter the model number of the gadgets. This versatile Harmony app can give you full guidance about how the Harmony hub will work. If in the case you had a previous harmony remote and you want your old settings back, this also has a feature by which you can copy the settings from your previous remote. Tech Integration: – Harmony Hub helps to have tech integration in the home. In high-tech homes bigger tasks can be performed including drawing blinds, controlling lights, and locking windows. This device won’t have any effect on ordinary lamps and standard windows. It is an advantageous and helpful bit of innovation, yet the value it has will depend greatly on the amount of integration it can use from it, making Harmony Hub a great gadget one can’t survive without it. This harmony hub has some apps linked to sensor controls, home locks, light dimmers, security system, alongside fun things which includes a cable box, Apple Tv, Xbox. Harmony Hub will help you to create activities for your devices. Activity is a combination of commands and inputs which can be performed by Hub. For example, you can set multiple actions which can be performed by pressing a single button. If you want to watch movies in a peace mode without any disturbance and too lazy to close the lights and lock the windows, you can do this all with just 1 button. Your Harmony app will automatically make as many activities as you want to perform. Also, if you want to play a DVD on your DVD player, it can be done by this app. Recently, Logitech has stated that Harmony Hub can be easily connected with Amazon Alexa, which means voice commands can be used to perform any activity. Using Amazon Alexa Echo, or Dot, you can control devices connected by just speaking loudly. You just need to buy Amazon Echo, Dot, or any other device which is compatible with harmony hub to utilize this feature. Life has become so easy and efficient that instead of switching off lights, turning on tv with remote, you can just say “Alexa, turn on the tv on any particular channel” and activity will be performed in seconds. You can easily adjust the volume and change the channels of your Tv, pause or fast-forward a movie by using your smartphone. You only need to do some gestures to perform the activities. For instance, tapping on the mobile screen will pause the movie, swiping up or down to open and close the blinds, swiping left to lock the doors, and swiping right to turn on the lights. Mobile also allows you to save up to 50 of your favorite channels. You also have the option to check the status of your connected devices using this harmony app. For instance, you can make sure if you have switched off the lights, or if you’ve locked the front door, or powered your AC off. If you have forgotten anything, you can easily do it from your mobile application. Another pleasant feature regarding the Harmony hub is its compatibility with numerous smart home devices. Additionally, it also works with IFTTT which connect other devices to the hub and create new activities. At this moment, there are over 65 applets for the Harmony Hub on IFTTT webpage. If the applet you want isn’t listed, then you can create a new one. Apart from that Harmony Hub also works with Amazon Alexa Device. 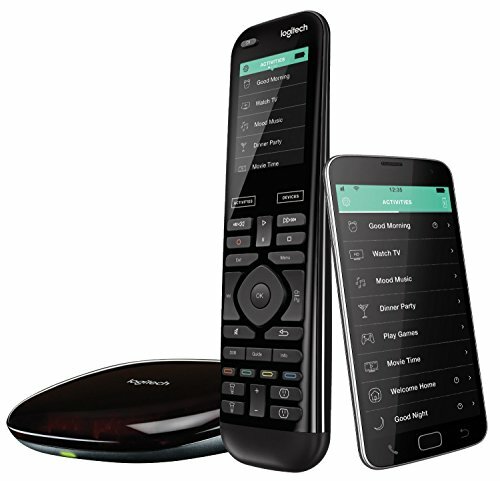 The success of Logitech’s Harmony hub and other remotes is dependent on its hardware features and programming. If you liked the cloud programming of “My Harmony” then we assure you, you’ll like this too. If you’re disappointed by exploring wizards to edit settings, then I’m sorry to say that it won’t change too. Cloud programming is very suitable for Harmony Hub remote as the remotes have been wireless, and you don’t need to connect the remote with your computer to make any changes. Moreover, other than updating firmware and connecting WI-FI on the remote with the ultimate option, you’ll never need to utilize bundled USB cable provided with the box. You just need to install the app and log in with your MyHarmony.com details to run the remote. Before, programming of Harmony remotes used to be done via PC. You can now even do that with the new update and some changes, but only some settings can be set up this way. But, if you don’t know, these touchscreens are also used for programming. The introductory setup of Harmony Smart Control is installed via mobile app, and syncing is used to update the settings. If you want different button layout on your remote compared to your friends remote, then you can easily customize it via a mobile app. If you want the same settings, then you can use duplicate programming feature. For IOS users, if you want to use Logitech’s Harmony Hub remote, you should minimum have iPhone 4s, latest iPad (3rd Generation minimum), or a new iPod (minimum 5th generation), and Mini iPad. All these devices should be iOS 8 updated. For the people who’re using Android, you should have smartphones or tablets with a minimum of 4.2 android version and proper Wi-Fi connectivity. Apart from that both IOS and Android users will also be needing Bluetooth, and Harmony app. Harmony Hub can still work on previous version phones, but for that, you need to download the app on your computer and connect it through Wi-Fi. After you’re done with installing Wi-Fi setup, you can continue using the setup on your older smartphone or tablet. There are some compatible devices which are bewildering at this moment, but there are still some devices that can’t be controlled by Hub. Fortunately, Logitech has launched an interface for third parties to come with their integrations for the Hub. Scheduling feature is making this Harmony Hub best in the market. You have to ability to schedule any activity you want to perform after some hours. For instance, you can schedule the activity that turns off lights, lock the doors, and close the blinds. Another superb feature of the Hub device is its integration with other popular devices. For example, your Harmony Hub can integrate with Nest Thermostat. You can easily connect it by download the Nest mobile app. You can set up any activities you want. For instance, when smoke or carbon dioxide appears then tv should be turned off. This will alert you to any dangerous things happening at home. 7) It is more reliable macros as compared to handheld IR remote. You can utilize the Logitech Harmony Hub remote with other Logitech remotes so that all the other members of the family can easily use the Hub even if your smartphone is not around. The major problem regarding this is that you need to pay much for these remotes and they’re quite expensive. If you by Harmony Companion, you’ll get Harmony Hub and physical remote, but it will cost you nearly 150$. Apart from this, you can also choose from any other Harmony Remotes that range from $50-$350. If you are looking for a simpler way to control your gadgets, then you should by Logitech Pop Home Switch because it’s easy to use and efficient. Gamers miss RS-232 in this device which would be beneficial for Hub and gaming consoles to control each other. Though Bluetooth connectivity and Infrared sensors are there which can control PS3 consoles and WII but RS-232 would have been a superb inclusion in this device. Hub remote can lose the connection with the app at any moment depending upon its WIFI connectivity. If WIFI has been disconnected, your hub will get disconnected too. The setup process can be difficult for some users as it’s hard to understand. To help the users, Logitech has introduced the tech support team. Users who are facing difficulty during the process of setting up the hub and adding devices, they can call or email them so that their problem can be solved. 5) The device relies mostly on IR, which is a slow process and not that much trust. 6) Programming options aren’t as wide as people like to have. 7) Third-party app for API is not compatible. 1) Dimensions are as follows: Height: 10.48 cm, Width: 12.8 cm, Length 2.54 cm. 3) Minimum of IOS 8.0 or higher devices are required, i.e., iPhone 4s or later version, iPad mini or 3rd Generation. Android devices should have Wi-Fi enabled with 4.2 android version or higher. 4) Bluetooth smart technology is necessary for the setup process. Hub is the best addition to the Harmony Family till now. It is an intriguing piece of technology that works well with Bluetooth, WIFI, and has a mini IR blaster so that it can work well with infrared receiver gadgets too. For the people who love smart home devices around them and has lots of tech integrated devices in their home, this Hub is worth buying. We highly recommend this device because the concept is very appealing, and some different kinds of stuff can be done in seconds by this device and app. The users who’re buying this surely has a distinct advantage for user programming. The device is a little bit pricey, but it’s worth it. Before buying the device have a look on the article above to see if your mobile or tablet is compatible with the device. Secondly, we wish that there were more features other than IR and Bluetooth. Two-way control options would have changed the complexion of this device as it would have been faster and more reliable device to use. Moreover, the other item which we’re interested in is a system programming interface for the third parties to have a strong network with the hub. The apps which are included are great, but there are so many other applications out there that would have improved the home theatre performance if they had some control over your drawing room. This would have made it workable for the controller to incorporate with the gear. Though this can’t control home theatre at-least, it is a major step ahead. The best thing about Logitech Harmony Hub is that it is an all in one remote. You can control as many devices you want with your smartphone, even if you are out of your house. It will help you to ensure if you’ve locked the doors, closed the tv even after you have left your house. Setup of this device is a little bit difficult, but it isn’t that painful. The instructions are straightforward, and it just takes some mins to set it up. If someone doesn’t understand the instructions, then they can contact tech support for assistance. This device is essential and beneficial for its users, and nice for people to have control over so many electronic gadgets from one single device.